At 5.45 p.m. Swamishri arrived on stage for the diksha utsav. The ritual mahapuja for the diksha ceremony commenced at 4.00 p.m. in the presence of Mahant Swami. When Swamishri arrived he gave bhagvati (saffron) diksha to 24 parshads and parshad diksha to 44 sadhaks. In all, Swamishri gave diksha to 68 youths. 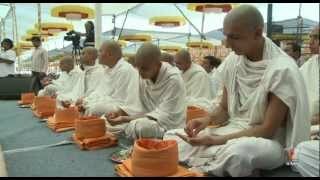 During the diksha rituals Swamishri patiently blessed each youth and his father. The atmosphere was surcharged with divinity and joy. The youths who were taking diksha beamed with the joy of renunciation, and Swamishri, too, looked radiant, showering his inner blessings on the youths and their parents. Swamishri also blessed Shri Vijay Bhatkar, a renowned scientist who developed the ‘Param’ supercomputer for India. Thereafter, an audio blessing of Yogiji Maharaj was relayed. 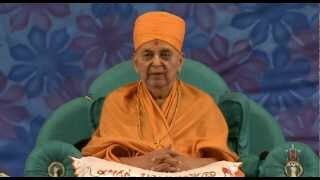 Finally, Swamishri blessed the assembly, “To give away one’s son for diksha is very difficult. Today, I would like to congratulate the parents who have allowed and dedicated their educated sons to become sadhus. I also convey my appreciations to the youths who have taken diksha. At 7.45 p.m. the diksha assembly concluded with Swamishri performing arti of Thakorji. In conclusion, senior sadhus honoured him with garlands.